Seeing through your customers eyes. As we’ve discussed here many times, seeing through your customers eyes is a very powerful way to spend some time if you want to be successful. A new service has been launched which offers you the opportunity to do just that at http://www.golferinsight.com. read on for more details. As a club owner or manager, have you ever found yourself saying “why am I the last person to know about this?” at which time it’s usually too late. Traditional forms of member communications can leave owners and managers vulnerable when it comes to evaluating their clubs performance, and making informed decisions. They often rely too much on front line staff to tell what’s really going on with regard to member interactions. Also, very few clubs have a mechanism in place that makes it easy and convenient for members to communicate directly with owners and management – so most don’t bother. The lack of effective member communications over time can spell trouble when it comes to member retention, loyalty, and bottom line profitability. I have a very simple system that I call my 10 Minute MBA. So called because it takes approximately 10 minutes for most of my clients to absorb the information before I see their face light up. After 10 minutes they suddenly understand something so key to their future success and that of their business that I usually call a coffee break right there and then, only 10 minutes into a meeting! Stand out from the crowd or get lost in it…you choose! They invariably sigh, then tell me that they have a golf course or courses and that due to that; they sell golf. They then usually (not always) go on to tell me that golf is golf is golf and…(they sometimes add the suffix…STUPID) as a result, they cannot differentiate themselves from other golf providers. Of course I try not to take it too personally, but I usually tell them to have a re-think about that last statement. Step 3 of my book: Golf Business Turnaround, the 7 Essential Steps to Success is called“Uncovering Your Golden Niche (and how to dominate it)”. Know exactly what your chosen market wants and how to “ringfence” those customers for yourself. Have a “company wide” vision about your competitors and know how to leave them languishing at the starting post. Have the knowledge and confidence to market and sell to a clearly defined customer base and be 100% certain that you are reaching them. Own and thoroughly understand a technique you can use over and over again to effectively prime your staff to understand and effortlessly sell for you at every opportunity..I call it the 10 minute MBA. You can get your copy of Golf Business Turnaround, the 7 essential steps to success by simply clicking here. 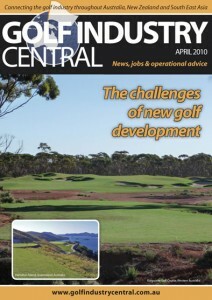 The latest edition of Australia’s Golf Industry Central Magazine is available to view online now. 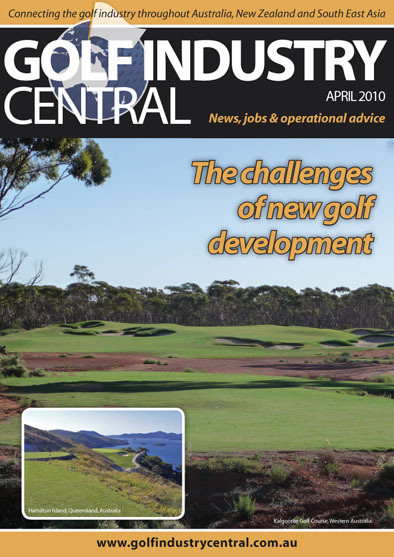 In the latest edition editor Mike Orloff asks: Do we need more golf courses or are we actually better off with less in Australasia? The latest edition of this excellent online, carbon neutral magazine is as always crammed full of thought provoking and refreshing content. You can view the latest edition here. One of the most talked about steps in my book Golf Business Turnaround the 7 Essential Steps to Success, is step 6, which reveals a formula for finding extra profit (a lot of extra profit) from what is essentially waste at present. Now as I strain to point out in the book, waste auditing and reduction, although a very exciting prospect when you see 20-30% extra profit winking at you, is not something that you should set out to do at the outset of the turnaround process (that’s why its step 6) as the process will be more productive and you will understand it better after you have implemented the first 5 steps. This ensures that you are auditing a smooth and stable business. However, all that said, the waste reduction process is a very exciting phase of the turnaround work laid out in the book and can genuinely add 20-30% to the bottom line for no extra cost. You can get your hands on your copy of the book right now here. Thanks to everyone who has bought the book so far, it’s been a very busy month for us here at hole18. Thanks also for your kind feedback regarding the book and the Mastermind Network resources. Due to the success of the Mastermind Network, we are about to embark on a new project which will see the group having its own dedicated site. This will not only allow us to expand the volume of resources we currently share as part of the Hole18 main site, but will also see the launch of some exciting new services to help members build more profitable golf businesses. Watch this space for more news in the next week or so. 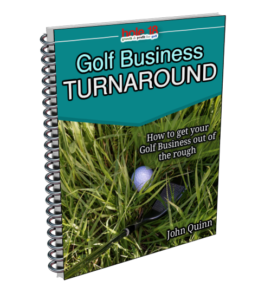 Meantime if you are one of the golf business owners who still doesn’t have a copy of Golf Business Turnaround, the 7 Essential Steps to Success, it is still available, just click here. Is Your Golf Business “Wasting” Away? Well things are “hotting up” here in anticipation of the imminent arrival of my new book Golf Business Turnaround-the 7 Essential Steps to Success, available here from Monday 25th January. In what is essentially a step by step blueprint for saving and turning around a struggling golf business, I will reveal many of the advanced techniques and strategies I use with paying clients; and apply the kind of thinking and business innovation that has attracted clients both at home and abroad to seek out our help here at hole18. …oh and by the way you can literally get your hands on it on Monday, because due to popular demand we are making it available to download directly from this site. Just think, by Tuesday you could easily be on your way to turning your golf business around for good. Imagine what a great year 2010 could turn out to be if you suddenly have a Blueprint in your hands to take you step by step through the total renovation of your business…this is a New Year Resolution on Ice! If you’ve been tuning in this week, you will know that I have been sharing with our readers, some of the groundbreaking, “golf business saving” content from my upcoming book. Get your cashflow (in and out) in great shape…fast. Positively differentiate your golf business from all of the others and give yourself a distinctly unfair advantage in the marketplace. In Step 5 of 7 in my new book Golf Business Turnaround-the 7 Essential Steps to Success, available here from Monday 25th January, I take you step by step through a system that will set up your golf business to run like clockwork to produce all of the profit and/or business you need with a positively awe inspiring formula for managing your day to day operations. “Operations” or the day to day running of their golf business is what gives most owners and managers the biggest headache. The minutiae of running a busy (or not so busy) golf facility can easily become a massive burden even for the most level headed and organised managers. If we pile business worries about cashflow and survival on to that its no wonder that many people cave in. In Step 5 we do the equivalent of playing some soothing music, giving you a shoulder massage, pouring you a stiff drink and letting you put your feet up…yes this is where your role suddenly becomes very, very clear and you start to instinctively know what to do and when to do it. Marketing is a critical business process that many Golf Clubs do very badly or not at all in some cases. With many clubs, marketing always means print advertising and indeed when speaking to some clubs, it becomes apparent that they actually refer to print advertising as “marketing”, as if this is the only way to attract customers! During the late summer of 2009 I saw a lot of golf club adverts appearing in local papers around the country. The culprits shall remain nameless, but almost to a man they were the most desperate adverts I have ever seen…you could almost smell the fear as green fees were slashed, catering was given away and hard one reputations were ruined overnight. These were mainly adverts to try to attract the “last of the summer wine” in the form of visitors who hadn’t materialised for one reason or another. I really felt for the club managers who found themselves in the dire straits that produced this kind of desperate action. The result I would imagine in most cases was a loss on the deal, because even if they did drum up some last minute bookings they would be for small groups and they had already given all of the profit away in the advert.